For the first time in a few years I had the chance to head home to St. Louis for Thanksgiving. Going home always means eating a lot and Thanksgiving always means eating a lot so I knew the weekend was going to be full of food. Of all the food I was planning to eat, nothing was more exciting, not even Thanksgiving dinner, than the dinner I had planned at Basso. Patrick Connolly is the executive chef at Basso. He graduated from St. Louis University High School the year after I did. (Shameless plug) In 2008, while working at Radius in Boston, he was awarded the James Beard Award for Best Chef: Northeast. I had eaten at Radius when he was chef there and the food was very good. I was interested to see what he had brought back to St. Louis from his time on the East Coast. You can hear Basso before you reach the door. The lively atmosphere of the basement bar rushes up the stairs and out the door. This is what Basso really is. Once you reach the bottom of the stairs, you find an upscale bar surrounded by mostly high-top tables and booths. Basso is much more of a bar than a restaurant, but the food doesn’t suffer. Dishes are as creative as the cocktails. Connolly’s time away from St. Louis shows and the city is lucky to have him back. Basso advises that the food is best shared. A few antipasti and a pizza made a great meal for three. The Emo Cover Band pizza, which was topped with sausage, pancetta, cippolini, poblanos, and house provel, was good but could have used more spice, especially in the sauce which was slightly watery. 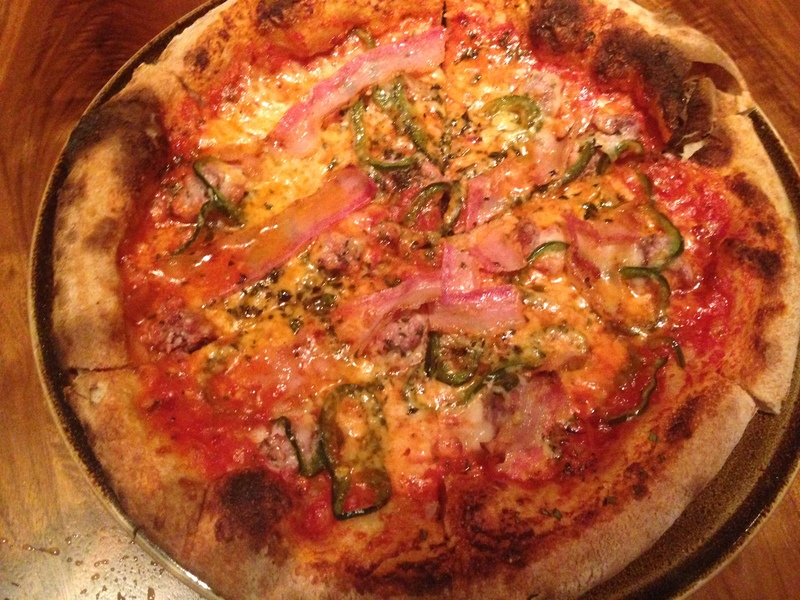 The wood-oven cooked crust was excellent as was the sausage. Overall it was good, but a little bit of a let down compared to the three dishes the preceded it. Carrot Panzanella, Curried Orzo, and Eggplant Caponata were all very good. 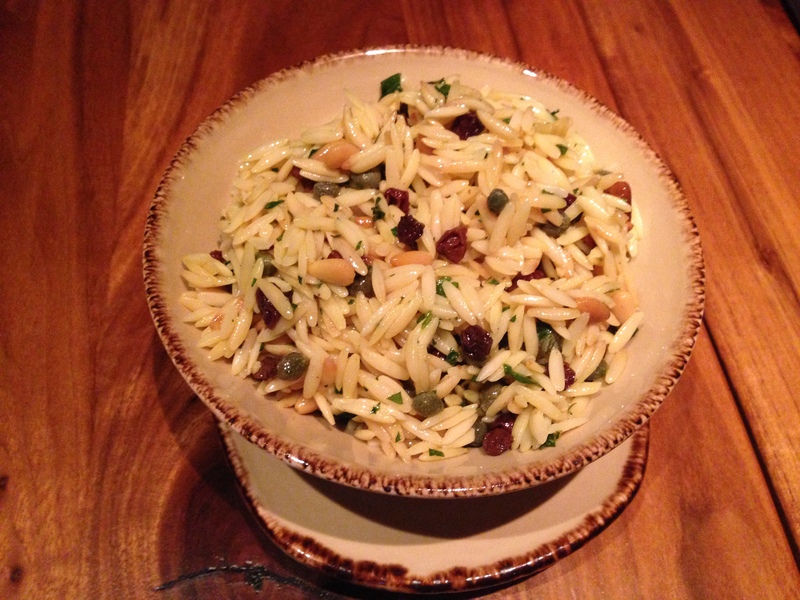 Like the pizza, the orzo could have used a little more spice but I really liked the pine nuts. The carrot panzanella was an accidental order, brought to the table by mistake, and then given gratis. It was a lucky mistake. 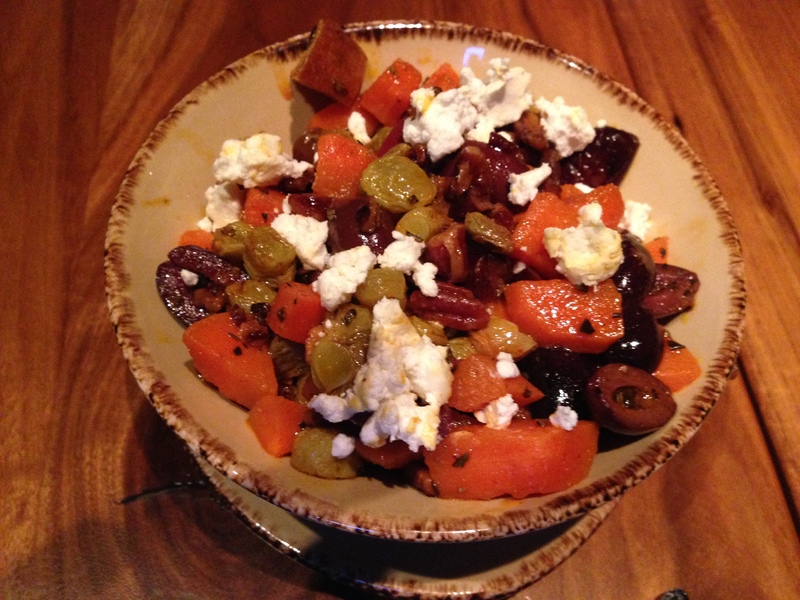 The blend of carrots, bread, raisins, olives, and goat cheese was magnificent. 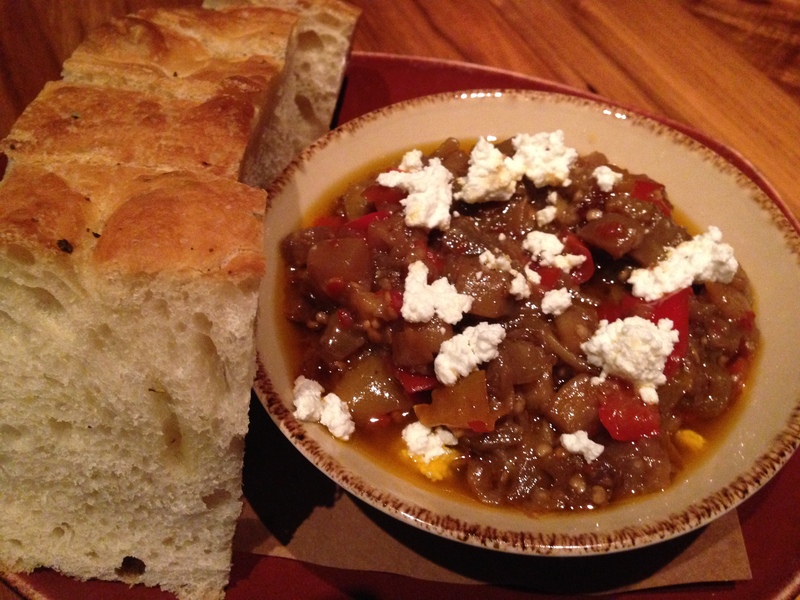 Even better yet was the spicy eggplant caponata, a simple blend of eggplant and peppers topped with smoked ricotta. I am a die-hard meat eater, but these three veggie dishes were great. In fact I would take this eggplant over steak tartare most days. The cocktails were creative and well balanced. I tried “The Redhead,” a martini-style drink made from rum, port ginger and citrus. 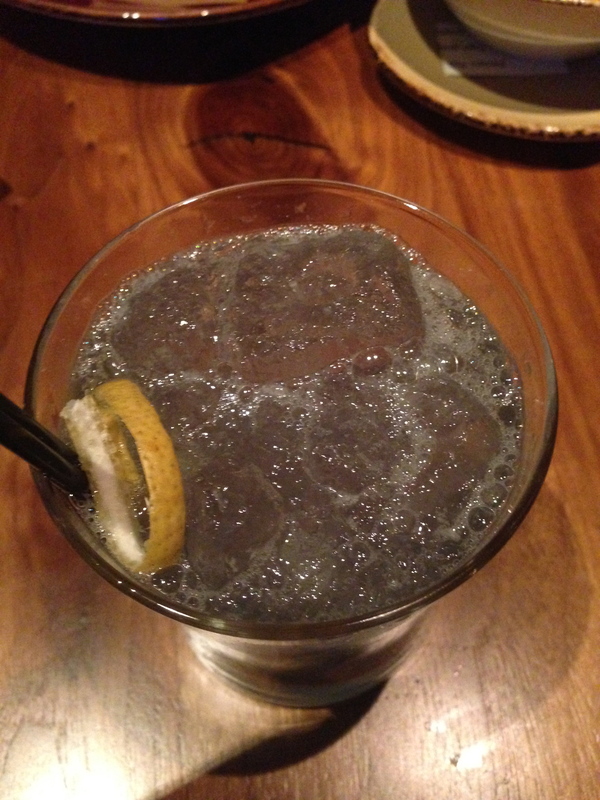 I also, swayed by the name and paying homage to Willy Wonka, enjoyed “You’re Violet, Violet” a sweet, but mild drink that went well with the spice of the eggplant. As I said, Basso is first and foremost a bar and they do cocktails well. They also have a beer and wine list, but I think it would be a shame not to try one of their original creations. Bassso is a lot of fun. The East Coast vibe shows through and provides a unique St. Louis dining experience. It’s the type of place to go with a few friends, share a few drinks and a few dishes, and have a good time. The food isn’t going to compete for a James Beard award just yet, but Connolly already has one. Clearly it was time to come home and have some fun and St. Louis is lucky he did.